The decision to cut the riser and drill pipe (DP) from the top of the Blow-Out Preventer (BOP) as a first step in putting the Lower Marine Riser Package (LMRP) over the leaking oil well in the Gulf of Mexico is not quite as easy as it might sound to a layman. This post is going to talk a little about a couple of the problems, as well as an alternate way of doing it, and should end with a possibly slightly amusing anecdote. 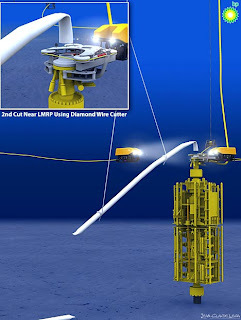 The current plan is to carry out the operation in two parts, first the main body of the riser and contained BP will be cut using a large shearing machine, and then a precision cut will be made with a diamond wire cutter to prepare the surface to act as a support and seal for the LMRP. (Illustrations are below the fold). There are a couple of reasons why this is going to be done this way, and one or two concerns that will need to be watched as the operation continues. Part of the problem lies in the considerable stress that the metal is under, which may make it more difficult to get the precise cut that is needed for the sealing surface. The weight of the collapsed riser on the kinked section of the riser means that the metal is under a considerable stress, and as the cut is being made that stress is going to be released. This is a particular problem if the saw blade is in the cut as that stress releases. As an illustration large diamond wheels are used in granite quarrying as a way of making the first cut in a new layer of rock. As the quarry works down into the deposit, however, the stress in the rock increases. So that when the diamond saw cuts into the layer, the walls will move in slightly. Now if the diamond saw is rotating until it is removed, it will grind away that small movement and there is no problem. But if the saw is removed, and the cut restarted the next day, then it might be necessary to recut the same depth again, because the walls have moved in that far. The much worse thing to do is to leave the diamond saw in the cut overnight – the walls will move in and pinch the blade and you can’t get it back out without destroying it. Did I mention these blades can cost up to $100,000. 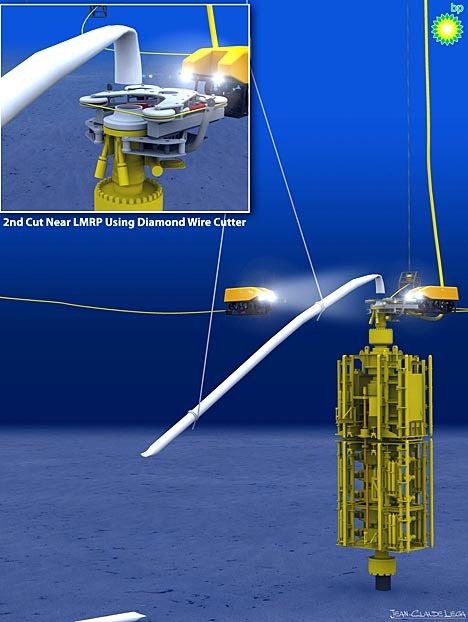 So given that it would be a bad idea to break the diamond wire in the cut, or trap it for that matter, the first step in the process is to take some of the load from the riser by cutting off the majority of the fallen pipe. To make this simpler and since the quality of the cut is not important, this will be done with a large shearing machine. For the second stage in the process the riser and pipe will be cut, at the top of the BOP using a wire saw to cut through both pipes. The diamond wire, which is held under tension in the design, should give a relatively smooth surface that can be used for the sealing surface to the LMRP. One of the problems in using this tool, which is rather sensitive (in other circumstances we have broken several wires in a smaller model) is dealing with the central DP as the cut is being made, and with the flow of oil and gas past the wire, which can send it into vibration, over the relatively long cut. The two pulleys at the top of the saw are used, as well as guides, as tools to keep the wire under the correct level of tension. It is relatively slow to cut, (perhaps 10 to 30 sq ft/ hour, depending on power and blade size) and requires patience to keep the applied loads at the right level (the joy of automatic equipment over manual operation). There are still possible risks, due to the remaining load on the metal being cut as it is being made, since the amount of metal left gets less over time. As a result it is likely that, in the same way as a forester will use wedges to stop the cut closing as he chops down a tree, so small metal wedges will be put into the cut in this case. The only difficulty that this imposes is that it will be difficult to access the central BP and difficult to deal with that, once cut through, since it is within the riser and not accessible. Hopefully it will be held in place by the bend of the pipe and riser, until the wire has passed through it. Over the past twenty years diamond wire sawing has become more common as a way of cutting through a variety of materials. It has the advantage of making a relatively narrow cut , and the ability to cut through objects made of different materials, such as reinforced concrete. The cutting wire used to have small diamond particles embedded in the steel of the wire, but in more modern varieties the diamonds are embedded in a plastic such as Teflon, and set as beads along the wire, allowing better cooling during the cutting process. Now my students will tell you that I have a bad habit of slipping commercials for another technology into lectures, and so I am going to indulge, and mention that there is an alternate technique that could be used instead. And that is the use of a high pressure abrasive laden, waterjet cutting stream. These are becoming increasingly used in industrial manufacturing, although in that use the technique usually involves a different way of adding the abrasive to that which would be used in the current problem. In the conventional way of adding abrasive it is mixed into the jet after the water is accelerated, and, in the right circumstances, we have been able to cut through half-inch titanium with an accuracy of 0.001 inches. Those jet systems operate at pressures from 40,000 psi to about 90,000 psi. In the current case the abrasive is added to the water from a pressure vessel, and the technique is known as abrasive slurry jetting (ASJ). It allows equivalent cutting at about a tenth of the jet pressure (i.e. 5 - 10,000 psi). 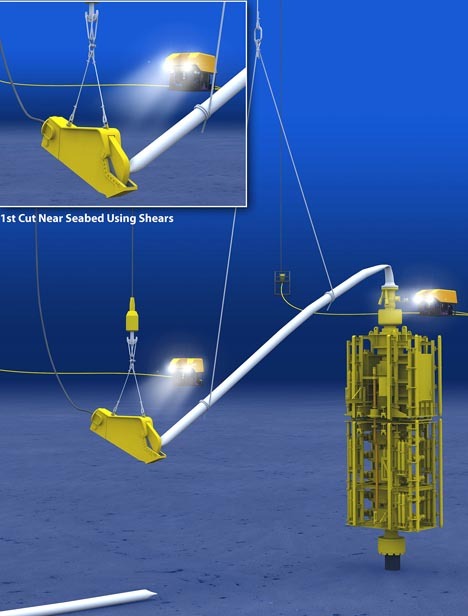 The tool has been developed for cutting off different oilwell parts from the wells under the North Sea. Because the jet cuts away from the nozzle, it can cut, for example, out from the center of a set of drill pipes, one nested inside the other, and separate them, as one of the last stages in decommissioning a well. It has a problem with range, the jet cutting to a shorter distance as the back pressure in the water increases, and for cutting down to 500 ft (the deepest we have tried) it can be improved to cut large risers by adding an air sheath around the outside of the jet. 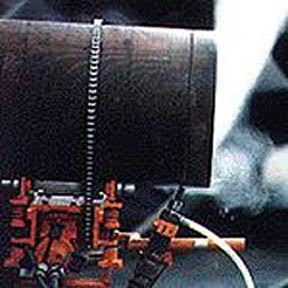 One alternate way that is used for cutting tanks and other containers with possibly explosive content is to use a chain crawler around the pipe. This way the jet does not have to cut quite as far through the water. (And for those who question whether jets would work under this depth, Gulf Oil – as was – used an abrasive waterjet to drill a well down to 15,000 ft back in the early 1970’s but a fire destroyed the equipment and the research was stopped). 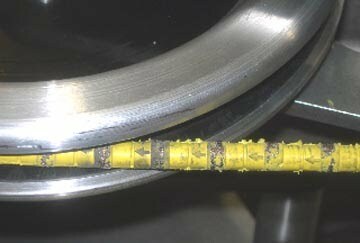 To end with the anecdote – which relates to the cleaning of oil rigs for inspection. The problem that arises is that barnacles and a variety of sea creatures and plants grow on these structures, and need to be removed. The historic method of doing this was to give a diver a chipping hammer, and send him down to chip off the offending coating. Now when a diver is in the sea there is not a lot of resistance, and so one has to clamp onto something to develop enough thrust to effectively use the hammer. The only object available is the rig itself, and wrapping one’s legs around a strut works to give the platform. The only problem is that the strut is covered in barnacles – ouch! So the waterjet industry developed a zero-thrust gun (in other words the cutting jet on one end is matched by a jet of similar power on the other, so the forces are balanced) and the diver does not need to hold onto anything. It was taken out to one of the rigs in the North Sea and given to one of the divers. He took it, without a word, and disappeared over the side of the rig. He was down underwater using it for about fifteen minutes and came back to the surface. He didn’t say anything, but walked over to the chipping hammer. He put down the lance, picked up the chipping hammer, and walked to the side of the platform. “So long , you son of a . . . .”, he said, and threw it overboard. It was one of the fastest adaptations of a change in technology around the world that I have seen. Anyway I will talk about using jets for efficient cleaning in another post. Enjoy the day! My thoughts on the above article about BP Oil Spill Issues: It appears there is a bolted flange to flange connection below where the diamond cut saw was cutting and became pinched on the assumption of riser weight issue. I also assume there is a reason that the flanges could not be unbolted, however, that is how the riser was initially attached. I would think there is a possibility to diamond cut between the existing flanges where they join each other. 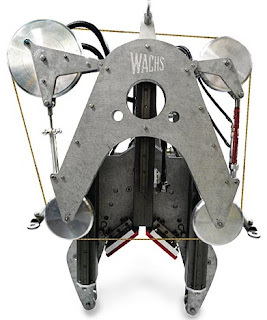 Without weight of old riser, a pinching problem with the diamond cut saw might be minimal. Once top flange is cut off, either drill new bolt holes, attach vice clamps or weld the new top flange to existing bottom flange and attach new blowout preventer and turn off well flow. Re-attach riser siphon pipe back to surface collection ship. I believe you have now accomplished immediately stopping 100% pf the oil flow into the gulf along with placing well back into production. I do not know how to attach drawing. Thanks, I'll be back later for some great information..
Thats a very nice and informative blog about CUTTING OIL PROBLEMS.I would like to thanks to share such a great info with us. Hello, I just wanted to say that I really enjoyed your site and this post. You make some very informative points.Keep up the great work!